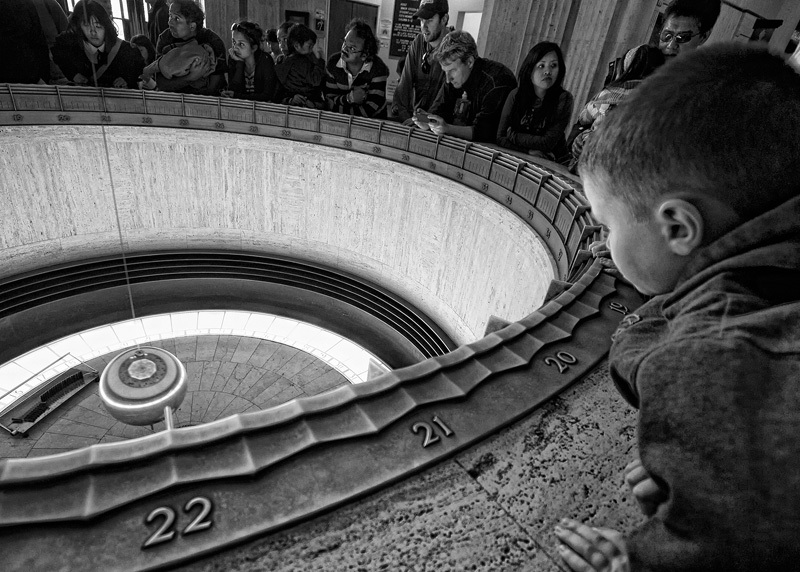 Exactly what the title says - the pit and the pendulum in the entry of the Griffith Park Observatory. The Pendulum swings, the earth rotates... it's quite fascinating! But I had a blast going there with Dale and Mae - thanks, guys! Congrats on the bird thingie!! lots of circles here. Great composition, Deb! im surprised i only gave this a six...i'm pretty sure it's because i think i saw another, not as appealing, shot from the same location first when i was voting. totally unfair, i should have rated this higher, i love the perspective, the slight distortion and the b&w treatment. Love this shot, Deb. It really captures the fascination people have with the pendulum. The shot was definitely worth the walk up that hill to the observatory! Griffith Observatory. A great facility. I wide array of faces. Makes me wonder ? Good image. A great place to take a shot for this challenge. However, if I saw this image outside of the challenge and were asked to describe it, "Circle" would not be among my words. I'm not voting, though... so maybe the rest will disagree. I really do love this image. Proudly hosted by Sargasso Networks. Current Server Time: 04/23/2019 08:41:15 PM EDT.